In a world of shadows, anything is possible-except escaping your fate.Ever since she was a child, Ivy has been gripped by visions of strange realms just beyond her own. But when her sister goes missing, Ivy discovers the truth is far worse-her hallucinations are real, and her sister is trapped in a parallel realm. And the one person who believes her is the dangerously attractive guy who's bound by an ancient legacy to betray her.Adrian might have turned his back on those who raised him, but that doesn't mean he can change his fate, no matter how strong a pull he feels toward Ivy. Together they search for the powerful relic that can save her sister, but Adrian knows what Ivy doesn't: that every step brings Ivy closer to the truth about her own destiny and a war that could doom the world. 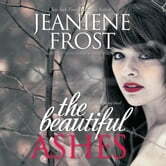 Sooner or later, it will be Ivy on one side and Adrian on the other-and nothing but ashes in between.